This recipe is sponsored by Udi’s Gluten Free, a year- long partner of Heartbeet Kitchen. I started cooking for Brian and I the first fall we spent together. Before that, I was a pretty typical 20-something who lived off sandwiches and microwave meals. Yes, true story. One of the first desserts I attempted to make was an apple crisp, after I’d convinced him to go to the orchard and proceed to lug around ten pounds of apples we’d picked. It has become our tradition every September, but oddly enough, my apple crisp recipe never stays the same except for using a mix of tart and sweet apples, along with pumpkin pie spice (it doesn’t have to be used exclusively for pumpkin – the combination of nutmeg, cinnamon, ginger, is so lovely with apples too!). Crisps/crumbles/cobblers…. it’s one of the few baking categories that doesn’t require exact precision, which my pantry loves. And is exactly how this breadcrumb version came to be when I realized I’d ran out of oats and all I could think about was that bubbling pan of cozy coming out of the oven. But I did have a few slices of Udi’s Gluten-Free whole grain bread hiding out in the freezer, which I promptly turned into breadcrumbs. And pecans. Brown sugar. And butter. It turned out homey, sweet, and comforting, with a generous crisp topping that’s nutty and toasted just right. Even beyond the breadcrumbs, the pecans alone give you plenty of delicious crunch to sink your teeth into. A little rustic, with a heavy dose of fall. As you’ll see, I peeled the apples, but if you’re really in a hurry, you can totally skip that. Bonus points for extra fiber. ;) And at any rate, it’ll save you a few extra minutes for scooping ice cream that melts gloriously into pockets of warm apples. Amen. In a large bowl, mix together apples, 1/2 teaspoon pumpkin pie spice, 1/3 cup brown sugar, salt and tapioca starch, so dry ingredients coat the apples. Set aside. In a food processor, pulse the torn bread until about 10 times. Then add pecans and pulse until all are uniform sandy crumbs. Toast in a dry skillet for about 5 minutes, until just fragrant. Do not overbrown. Remove from heat and stir in remaining 1 teaspoon pumpkin spice, 1/3 cup brown sugar, melted butter and generous pinch of salt. In the bottom of a greased casserole pan, sprinkle 3/4 cup of the crumble. Then add apples, patting down lightly. Top with remaining crumble. Bake for 45 minutes to 1 hour, putting aluminum foil lightly over the top 20 minutes into baking to avoid top becoming too brown. Serve warm with vanilla ice cream. I only became a serious cook when I was trying to impress a new love interest (before then I was just a sandwich and microwave meal person too), and ten years later he’s still with me so I must have been doing something right , lol! And the crisp/ crumble/ cobbler is my go to dessert recipe because I am hopeless when it comes to following precise recipe instructions! And apple crips is by far my favourite! 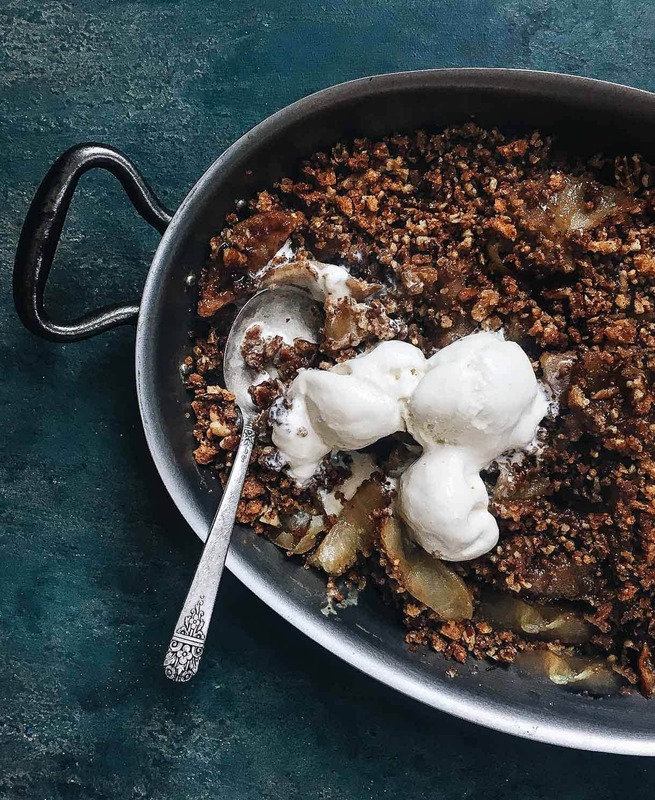 This apple crisp looks WONDERFUL! Could I substitute the butter for vegan butter or melted coconut oil? Yes, vegan butter! No to the coconut oil. This is so clever, Amanda! 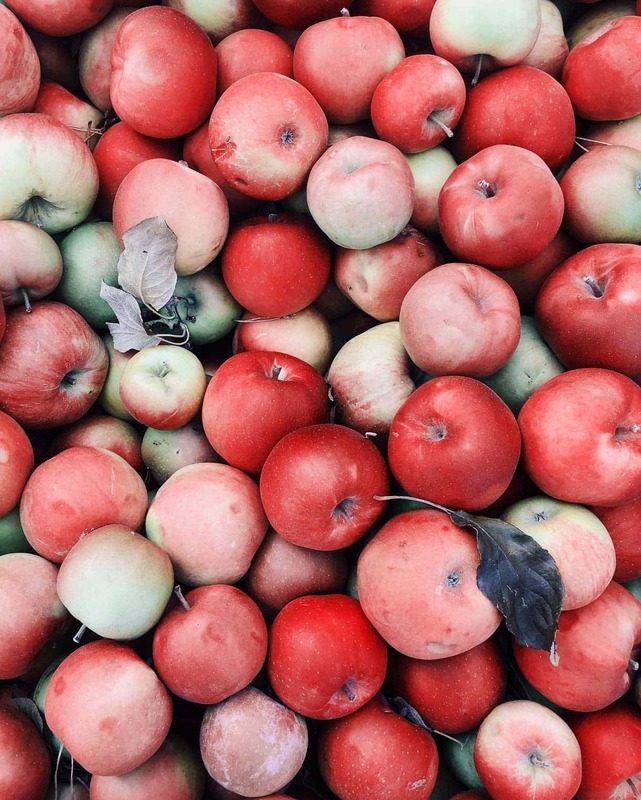 And I’m a sucker for apple crisps, crumbles, and pies.. but who isn’t during fall? Love how easy this is… I must try it!! I am such a sucker for anything crisp or pie or apple.. any dessert really haha. Thanks for sharing, I can’t wait to try this recipe! me too! i love the softness of the fruit with a little crunch. thanks for stopping by!